China's largest aircraft leasing company, ICBC Leasing, has ordered 30 ARJ21-700, the country's first domestically produced regional jet, from Commercial Aircraft Corporation of China (Comac). The ARJ21, short for Advanced Regional Jet for the 21st Century, is a regional airliner designed and manufactured by Comac and the first domestically produced airplane. 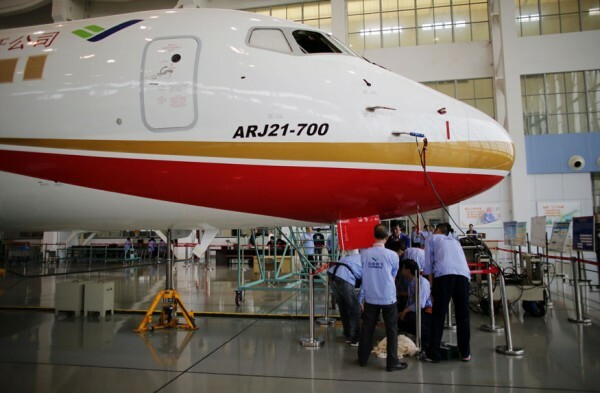 The ARJ21-700 was officially certified by the Civil Aviation Administration of China at the end of 2014. ICBC Leasing's order for 30 planes of such kind has brought the total order for the locally-produced regional jet to 308. The value of the order was not disclosed by both ICBC Leasing and Comac. The plane features 78 seats in a dual-class configuration and 90 seats in a full economy class configuration, Comac said in an earlier statement. The plane's economic life is designed for 60,000 flying hours or 20 calendar years. In 2011, ICBC Leasing ordered 45 of the nation's homegrown C919 passenger jets from COMAC. The financial leasing arm of Industrial and Commercial Bank of China, the country's largest lender, signed the new order as it sought to expand its fleet size to cash in on the country's rapidly growing demand for air services. Meanwhile, Comac is set to launch China's biggest passenger aircraft later this year - the C919 large passenger aircraft. The plane features 168-seat and 156-seat layouts and will compete with Boeing and Airbus in the medium-range aircraft sector, said Comac, the plane's manufacturer. Comac has already received orders for 450 C919 planes from 18 customers, mostly from the domestic airlines. Plane manufacturers in China are scrambling to meet the demands of both local and international aviation industries. In the next decade, China, the world's second-largest economy, is forecast to become the world's largest domestic aviation market, said global plane manufacturer Airbus. An earlier forecast also said China will need more than 5,300 new passenger aircraft and freighters between 2014 and 2033.